Just like their wild cousins, domestic rabbits’ diets should be made up of around 85% grass or hay. Grass or hay is vital, for two very important reasons. The first is so that they have healthy guts and the second is their teeth. Rabbits’ teeth grow continually. They have evolved so the specific action of chewing the long strand fibre of grass or hay wears the teeth down evenly. It is only this chewing action that keeps their teeth properly worn in the way nature intended. If a rabbit isn’t eating enough hay then its constantly growing teeth will not be naturally worn down. The edges will continue to grow and cause painful spurs which cut into the gums, tongue and sides of the mouth. Rabbits with painful spurs may need to have their teeth burred down by the vet. This requires an anaesthetic, which of course carries some risk, but is necessary in this situation. Because rabbit teeth grow continuously, this will need to be repeated, usually every 2-4 months. It is far better to stop the problem before it even starts, by giving the rabbit its correct natural diet. As well as preventing problems caused by dental overgrowth, the long strand fibre in grass or hay is vital to maintain healthy gut movement. If a rabbit’s gut is not moving as it should then stasis can set in, meaning that its system literally shuts down, an often fatal condition. The conditions listed below can be caused by an improper diet. If your rabbit has any of the conditions on the list then they should see a vet immediately (in the case of Flystrike it is an extreme emergency). 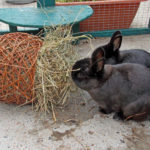 This page stresses how a proper diet is at the heart of good rabbit health. The conditions described can also be caused for other reasons so please check the Rabbit Care Advice section for more information.